Are the ISS US Segment solar arrays double-sided? Some answers on this site claim that the ISS US Segment solar arrays are double-sided (i.e. cells on both sides of the blanket). I tend to doubt this, but a search of my references did not turn up anything authoritative. 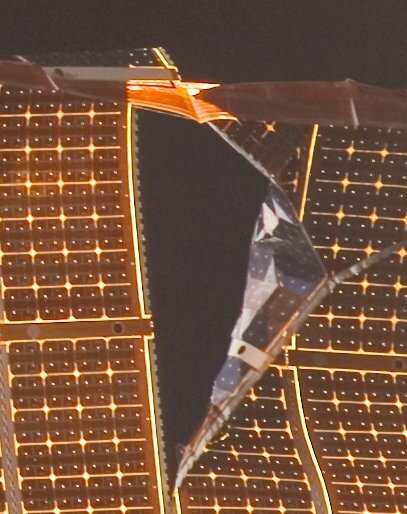 This image from the solar array repair EVA performed on STS-120 seems to show that the faces of the array are not the same (cropped from here). It is difficult to obtain images that show both sides of the array at once. I seek an authoritative answer with solid documentation reference(s) that explicitly states one way or the other. NASA or contractor documentation, preferably. Having worked extensively on the solar arrays over the last five years, I can say they do receive about a third of their power from albedo exposure to the back side. This is further confirmed from a "funny" I noticed in 2014 when doing testing on ISS solar cells. When trying to measure a solar cell's illuminated short-circuit current, I measured a value two and a half times what I expected. I soon discovered that I was not controlling the reflection of light behind the cell. Placing the cell in front of some black felt brought the measurements back in line with expectation. Unfortunately none of the design documentation I am aware of is public. Unless someone here knows of something that has been released, I don't think you'll find authoritative confirmation beyond the assertions of individuals familiar with the hardware. Not the answer you're looking for? Browse other questions tagged iss solar-power or ask your own question. How are the silicon PV cells constructed in the ISS's solar panels? Are they as flexible as they appear here? What is the difference in solar panel efficiency between Solar Impulse & ISS? Why does the ISS not use the most efficient solar panels available? Were the ISS Solar Arrays manufactured as a set? Is it possible to see ISS solar arrays with naked eye, from earth?